MD - Radio Diagnosis/Radiology, M.B.B.S. Dr. Rajarshi Bahadur, MBBS, MD (Radiology) is a Radiologist at Mukat Hospital, Chandigarh. Conjointly, he is associated with a number of leading hospitals of the region as a Radiologist viz., Atulaya Healthcare, Ace Heart Hospital, Surya Kidney Centre. 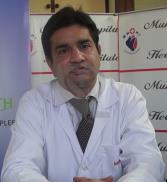 Prior to joining Mukat Hospital, he worked as a radiologist at Fortis Hospital, Mohali. Dr. Bahadur completed his basic medical studies(MBBS), from NHLMMC, Ahmedabad, Gujarat. Thereafter, he went on to accomplish his postgraduate degree (MD- Radiology) from Gujarat University, Ahmedabad. Besides, he has done advanced training in Radiology from Freiburg University, Germany. ***A highly refined and competent radiologist in the city. Compassionate and dedicated towards patient care. A radiologist of choice of most of the Doctors. Known for his fast and accurate diagnosis.